Jewell Loyd has had four consecutive 20-plus points games, and averages 26. Neil Enns/Storm Photos. 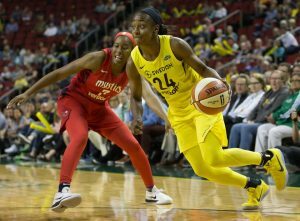 The WNBA schedule makers were not kind to the Seattle Storm when charting the opening weeks of the 2018 season. Though every team will at some point be faced with the challenges that come with a condensed schedule — to accommodate the start of the FIBA World Cup in late September — the Storm was handed a slate of six games in 12 days after its season-opener. Formula or not, something is working for Seattle, which has rattled off four straight wins since starting its game-day-off-day stretch. Unsurprisingly, they’ve done so on the backs of their young stars, with Jewell Loyd and Breanna Stewart averaging 26 and 21 points, respectively. That accounts for approximately half of the team’s scoring punch, with Seattle currently second in the WNBA in points per game. The contributions of fifth-year forward Natasha Howard, seen guarding Tianna Hawkins, have put her into the Storm’s starting lineup. Neil Enns/Storm Photos. Perhaps more unexpected than the strong showing from the young duo are the early contributions of fifth-year forward Natasha Howard. Acquired in an offseason deal with Minnesota, the Florida State product has averaged 14 points and seven rebounds in just under 28 minutes a game since entering the starting lineup after the opener. Howard’s early success has loomed larger in the absence of Crystal Langhorne, out since suffering a bruised right rib in the second quarter against Chicago last week. 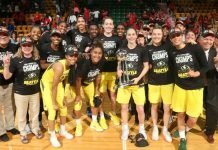 In that game, she capped a 14-point fourth-quarter comeback with the game-tying basket with eight seconds to play, before running the length of the floor to block the would-be go-ahead score. But that matchup was also an example of how some early season circumstances have worked in the Storm’s favor. 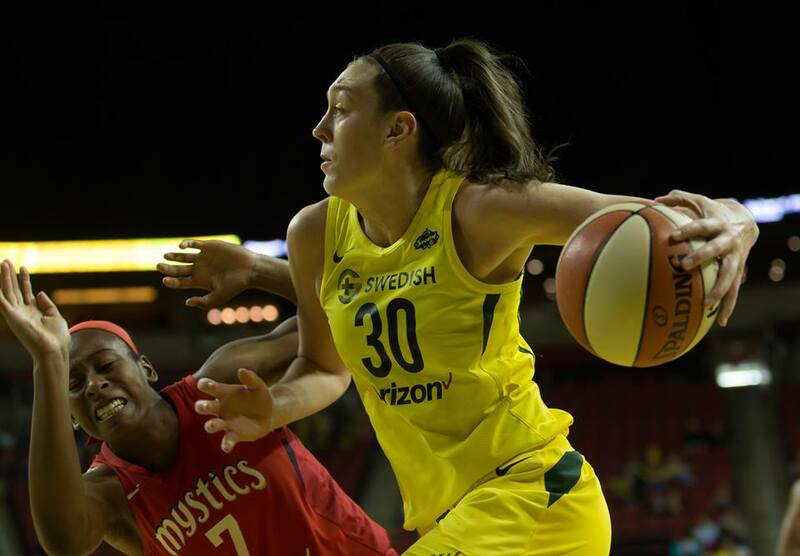 Chicago was (and still is) without reigning league assists leader Courtney Vandersloot as she finishes her EuroLeague season, while Las Vegas was missing star point guard Moriah Jefferson in Sunday’s 105-98 loss as she recovers from right knee surgery. 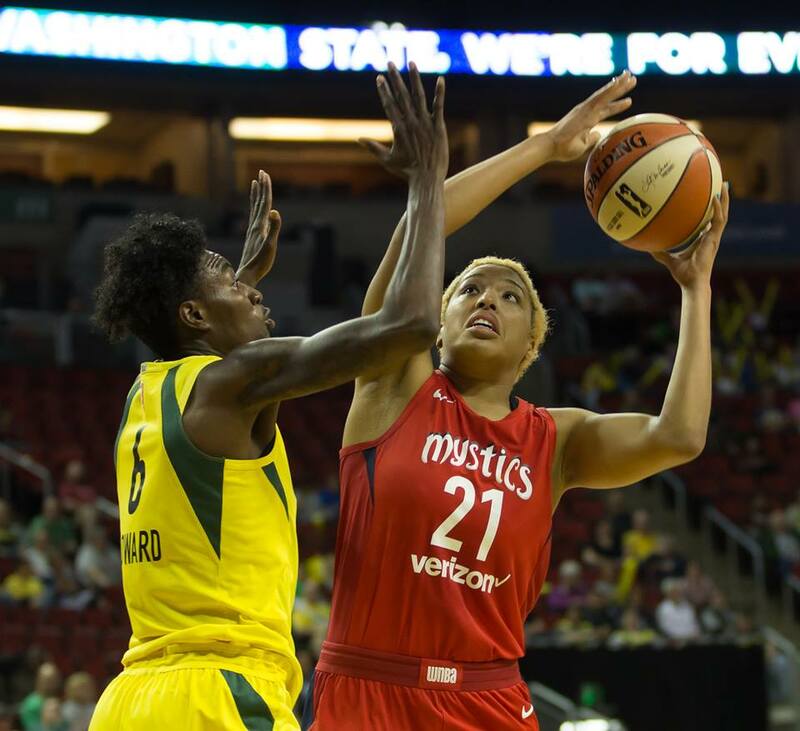 On Tuesday, Seattle faced a Washington team with just eight active players, missing both 2016 MVP Elena Delle Donne (illness) and Natasha Cloud (kidney stone). 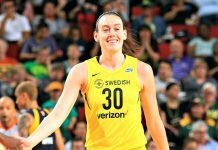 Breanna Stewart is averaging 21 points per game so far in her third year with Seattle. Neil Enns/Storm Photos. Regardless, the Storm have taken care of business against those short-handed opponents, and now holds the second-best record in the WNBA, trailing only the undefeated Connecticut Sun. They’ve been there before, starting 4-1 last season only to later drop six games below .500, change coaches mid-season, and ultimately lose in the first-round of the playoffs for the second straight year. To avoid a similar fate, they’ll have to keep winning games even when the schedule is less than kind. The span of games every other day continues Thursday at the Key with a rematch with Las Vegas, and Saturday in Dallas against the Wings. After that, the team gets a five-day reprieve. In the meantime, Hughes will continue to toe the line between having his team rested, but ready. That means plenty of film and mental preparation. “You do as much as you can without physically putting them back on the court,” he said. Noelle Quinn missed her fifth straight game for Seattle as she continues to recover from a right knee injury. The 12th-year veteran did participate in warmups. Seattle signed Mercedes Russell on Wednesday, adding the second-round pick out of Tennessee. 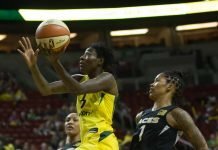 The 6-foot-6 center was cut after two regular-season games with New York, in which she had five points, two steals, two rebounds, and two assists in 33 minutes of action. To make room on the roster, the Storm parted ways with third-round selection Teana Muldrow. With Tuesday’s win, Seattle has now won 13 of its last 14 against the Mystics at KeyArena.